I just got this gorgeous Kei Japanese import Bark Cloth from Fabricworm (get it here) and was inspired to make up a little forties-ish cap-type sunhat. I hope you like it as much as Miss Niko did! Measure 1.5″ in all the way around, mark with an air erasable marker, and sew another line of stitches. You, my friend, are done! Cute! That could work for a boy too… right? ca-ute! and so easy, it looks like. I'll have to try this one. I think I'd like to make one of these for myself! Would you have suggestions on how to alter the pattern for an adult size? sara, just size it up to 120 or 125% percent! I may make one for myself also. Made one for my son today but it didnt fit.. hes 10 months old .. ( scaled it down to 80% for him).. I think ill try again.. I lOOOOOOOve it! squirt! that's a bummer, i'm sorry! head size is such a difficult thing to pattern for! was it too small or too big? I made this hat last night – it is so cute!!! I am a newbie sewer, following the directions exactly and it took less than 2 hours (probably only 1 hour). FYI – my daughter is just a year old (wearing 24 mo. clothes) and has a good head of hair and this hat just fits. I will make another one a little bit bigger for her. My 4 year old son also wants one, so I might enlarge by 20% to see how it works. jmoose thanks for the feedbacl. okay so i am changing the sizing notes because i know i can't predict! and send us a picture!!! yeah I think the 100% would work for my 10 month old ( he is in the 95th percentile for head size, though) lol! My daughter wants one too. shes 3 so ill be playing around with enlarging.. I absolutely love love love it. so cute, so easy. i will be making these for all the kids birthdays in my moms group i think.. thanks for sharing..!! FYI – I made another hat after increasing the pattern size to 120% and it almost fits MY head!! I'll use that size pattern for my 4 year old son and probably only increase the pattern to 110% for my 1 year old daughter. thanks JMoose.. awesome. ill do that size for my tall 3 yr old.. I just made the hat for my nephew at 120% and it fits on my adult head (22" circumference) but is short and looks funny. Not sure if it will fit my nephews head (19.5" circumference) or not, I will have to send it to him and see. OK – I made another and this time it came out great! I enlarged the pattern to 130%, and added an extra inch in length. (I continued the flared line out one inch longer and drew a straight line across the bottom) This worked perfectly! I think making this hat when you have the head that it's going on right there is helpful. I will still send the other to my nephew to see if it fits. I made this hat yesterday and it was very cute and fast. I tried it on my friend's 14 month old who has very little hair and it was much too small! Apparently she has a large head. I am going to try it on my niece who is 7 months. Hi! thanks for sharing & guess what! I succeeded! 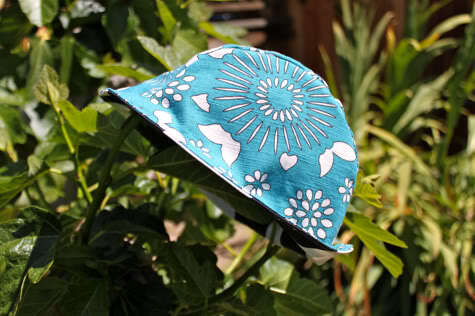 I made my very first sunhat & it fits my 6 year-old daughter's head well… Thanks so much! I love this pattern – but I think my technique is not right. I'm getting some overlapping fabric as I'm trying to sew the curves on the sides of the hat. Does anyone have tips or pointers as to how to sew this smoothly? this is a bit small for my one-year-old. but I think that if I had done a smaller seam allowance it might've worked. I made this according to the pattern… eliminated the second external stitch and it was still on the small side for my 1 year old daughter… her head circumference is at 55% on the national average. I will slightly enlarge this pattern and I think it will fit beautifully! Love this thank you so much! I want to make this too, but the pattern isn’t working for me either!